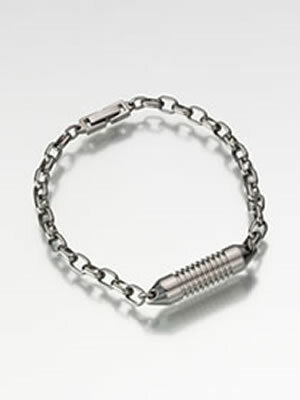 The lustrous Titanium Bracelet Keepsake Urns are made of highly durable, noncorrosive, nonallergenic, and nonmetalic titanium. Stronger than steel, titanium is surprisingly lightweight. It is also noted to improve blood circulation when worn. The keepsake bracelets are available in two sizes; a smaller link bracelet (upper photo) measuring 8 1/4" and a bolder link bracelet (lower photo) measuring 8 3/4" in length. Perfectly suitable for everyday wear by men or women. Usually ships same business day if order is placed by 2pm Eastern Time. Ships from the Midwest.